What does it mean to “come out”? We all generally think that coming out means a big declaration, a gay person screaming to the world “I’m gay and I’m proud!” At the very least, most would agree that coming out involves some sort of verbal announcement to or discussion with those who don’t yet know your secret. This is typically how psychological research thinks about coming out, and this is mirrored in U.S. popular culture. TV shows and movies have heartwarming scenes in which a young gay person learns that the best life is an out life; news stories and YouTube clips capture unique narratives of people who discuss their gay identity with their friends and family; academic research advises gay people to tell others in order to be healthy. While these are great examples that reinforce the generally good advice to come out to others, is telling others the only way to let them know that you are gay? Some scholars suggest that verbal disclosure as a coming out strategy works primarily within a white and male framework and is the best strategy for gay white men. Most of the data that we have on gay identity and coming out (at least in psychological research) is from gay whites (men, in particular). This isn’t necessarily a bad thing. Verbal disclosure is good for gay white men. But when verbal disclosure is thought to be beneficial to all gay people, certain issues arise. But, is this alternative “tacitness” strategy healthy? And for whom does this strategy work? A new research paper I published with Kevin Delucio and Monica Biernat examined this question. An important element in both the traditional and alternative coming-out strategies is (non)verbal disclosure. So, we examined how verbal disclosure influenced subjective well-being — happiness and life satisfaction — for gay white men and gay Latino men in the U.S. Consistent with beliefs about verbal coming out, we found that more verbal disclosure of one’s gay identity predicted higher well-being, but only for gay white men. Verbal disclosure did not affect well-being for gay Latino men. This does not mean that gay Latino men don’t or shouldn’t verbally disclose. The data suggest that gay Latino men don’t need to verbally disclose in order to have higher well-being. Therefore, verbal disclosure seems to benefit gay white men’s well-being but doesn’t seem to affect (either positively or negatively) gay Latino men’s well-being. But why does verbal disclosure affect the well-being of gay white and Latino men differently? We examined two possible reasons; feelings of authenticity and endorsement of a relational self-construal (don’t worry, I’ll explain this below). Reason 1: Feelings of authenticity. We found evidence that for gay white men, the more they verbally disclosed their gay identity to others, the more they felt they were showing their true, authentic selves, which in turn predicted greater well-being. This makes sense when you think about the experience of being gay. If you don't tell others, you are hiding. If you do tell others, you are "finally expressing the real you,” which leads to a host of beneficial outcomes; in this case, higher well-being. However, this pattern did not emerge for gay Latino men. For gay Latino men, verbal disclosure (either low or high) had no effect on their feelings of authenticity. This is not to suggest that feelings of authenticity do not improve well-being for gay Latino men; they do. What this does mean, however, is that verbal disclosure (how we typically define "coming out") has nothing to do with how gay Latino men express their authentic, "true" self. Reason 2. Relational self-construal — including others into one’s views of self. “Relational self-construal” is the extent to which you include other people into how you view yourself. As gay white men verbally disclose to others that they are gay, they begin to include specific individual relationships (e.g., best friend who now knows of and accepts their gay identity) into how they view themselves, which leads to higher well-being. 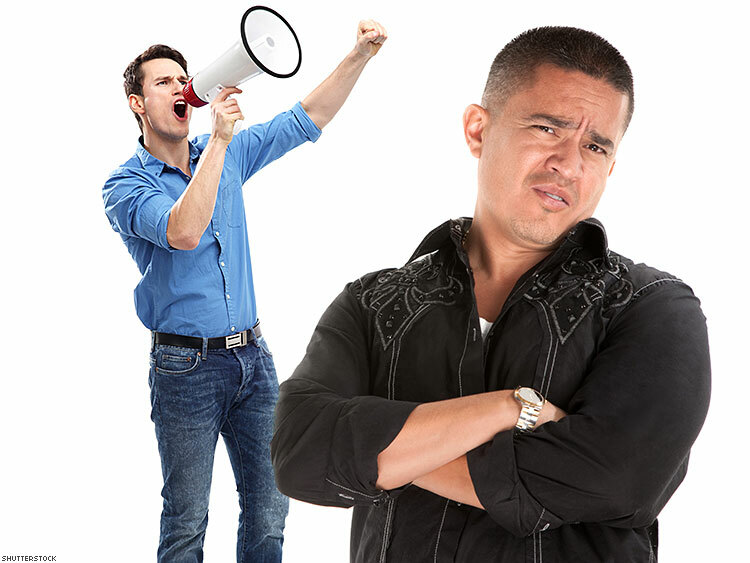 In essence, gay white men who verbally disclose begin to shift from viewing themselves as a completely independent person to someone who is connected with and understood by relationships with important others who now know they are gay. But this pattern did not hold for gay Latino men. Gay Latino men can (and do) have a "relational self-construal," but it is not influenced by verbal disclosure (or even perhaps their gay identity, overall). For gay Latino men, they may already feel strong connections with others — perhaps based on their ethnic identity — and verbal disclosure of gay identity to others has no impact on these feelings of relatedness. So is there a “best” coming-out strategy that people should practice? The answer is, it depends. Our research suggests that verbal disclosure is good for gay white men’s well-being, and we demonstrated two reasons why this is the case. However, verbal disclosure isn’t as beneficial for gay Latino men’s well-being. In fact, gay Latino men can practice verbal or nonverbal disclosure without taking a hit to their well-being. Can gay white men practice nonverbal disclosure? Of course, many can and do, but this strategy may contribute to lower well-being. The tak away message: We suggest that verbal disclosure is good for gay white men. Yet verbal or nonverbal disclosure is fine for gay Latino men. Of course, we need more research to study these patterns, especially as they play out over the long term. But it seems that a one-size-fits-all notion of what constitutes healthy expression of gay identity is not viable. ADRIAN VILLICANA is a graduate student in social psychology at the University of Kansas.